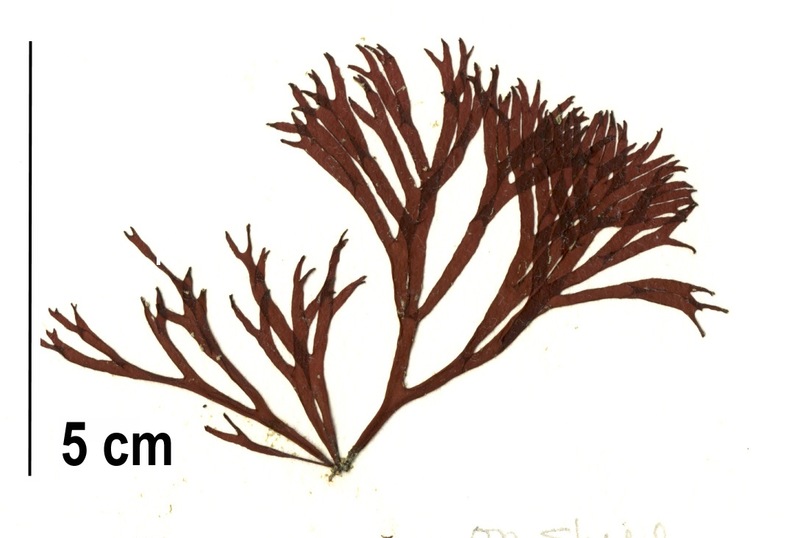 Specimen collection numbers PTM 429 and SCL 15306 in the UBC Herbarium Algae Database. Search the collection numbers in the database for more information on these specimens, or search the species for further occurrences. Images courtesy of Sandra Lindstrom. 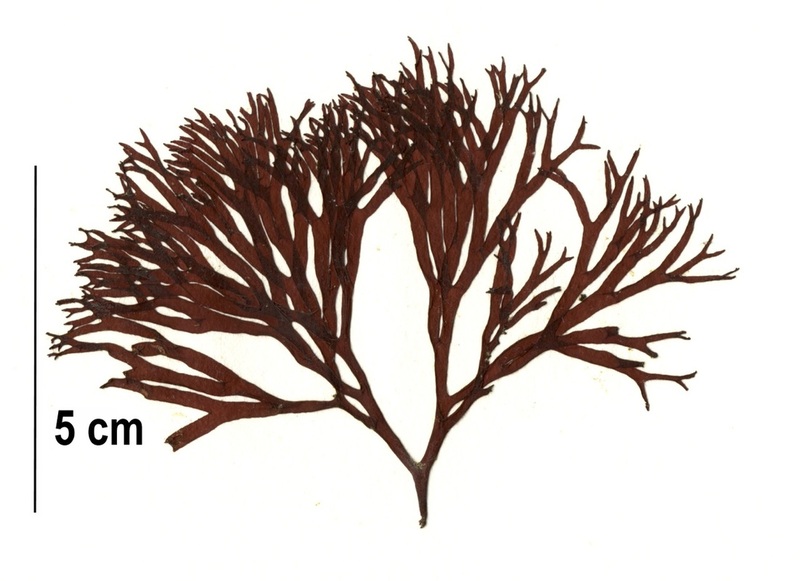 The thallus of this relatively uncommon red seaweed is typically dark red in colour, gelatinous in texture, and dichotomously branched (usually 10-15 times). Red antlers grow in a bushy, erect fashion, and can reach 15 cm in height. Cylindrical branches can be up to 5 mm in diameter. This species is attached to its substrate by a small disc shaped holdfast. Red antlers are dioecious, meaning that male and female reproductive structures occur on different plants. Male and female plants are morphologically quite similar, however male plants are typically slightly smaller and have bent branch apices. Male plants are also bright pink when reproductive. This species can be found in the mid to low intertidal to depths of 10 m. It is more common in outer coastal waters compared to inner waters. Its range extends from northern Southeast Alaska to Baja California and includes Costa Rica. One suggestion for its apparent preference for outer waters is its inability tolerate the lower saline conditions of inside waters. The specimens pictured here were found on subtidal boulders (7 – 8 m depth) on beaches near the Hakai Institute on Calvert Island. ​Lee, Yongpil, and Yong Deok Ko. "The red algal genus Scinaia (Galaxauraceae, Nemaliales) on Jeju Island, Korea." ALGAE-INCHON- 21.3 (2006): 267. O'Clair, R. and Lindstrom, S. Scinaia confusa (Setchell) Huisman 1985. In Klinkenberg, Brian. (Ed.). E-Flora BC: Electronic Atlas of the Plants of British Columbia. Lab for Advanced Spatial Analysis, Department of Geography, University of British Columbia, Vancouver. Accessed 2016-04-06.